My Dine-a-Round was wonderful! We didn’t remember to take photos, so I’m sending ones of our round dining table after the party. Great people, real connections… a celebration of Spring, creative process and friendship. On January 1, new California law SB 826 went into effect, requiring all public companies in the state to have at least one woman director on their board by the end of 2019 and two more by end of 2021. 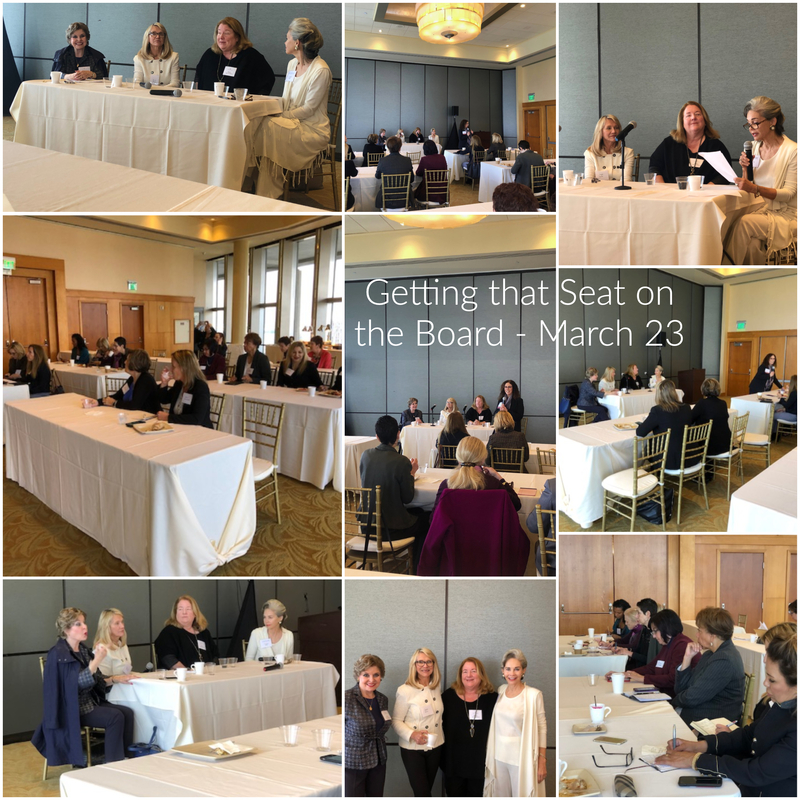 Trusteeship members and guests gathered at the Dorothy Chandler Pavilion for a panel presentation and learned from three of our own esteemed members who serve on Corporate Boards. They shared their experience and advice for being named a Corporate Board Member. Networking is key, it is always about relationships and who knows who. People want to work with people they know, or who have been recommended by someone they know (80% recruited by friends/colleagues 20% by search firms. Understanding the consumer (Betsy M. is on many private boards due to her understanding young consumers). Understanding what employees need (women traditionally have an HR focus. Many women head the compensation committee, as many men don’t seem to want to say how much the CEO should make or deal with that negotiation. Important – Be good at one or two things and brand yourself, so people start thinking of you when they need that expertise. Boards want to put people on who are relevant, so if you are older (usually you are making an 8-10 year commitment) you must be able to show you are relevant (think if you are 62 in 10 years you are 72). Age is a number, and it is trending younger, but still lots of older board members, but as usual may be harder for older women. Think about the value you bring, and also make sure you get value out of it as well. Betsy Berkhemer Credaire, CEO, Berkhemer Clayton Retained Search – Board Member of: CEO of 2020 Women on Boards Statewide California Board of National Assn of Women Business Owners (NAWBO-CA), sponsors of the California Law Women on Boards, SB 826, enacted January 1st, 2019. Past Boards: SoCal Edison Consumer Advisory Board, UCLA Health Sciences & Medical Center Advisory Board. Author: “The Board Game — How Smart Women Become Corporate Directors”, “Winning the Board Game–How Women Corporate Directors Make The Difference” (out in May, 2019). Betsy McLaughlin, named 2018 Director of the Year for Growth Companies by The Forum for Corporate Directors. Board Member of: Everlane, BarkBox, Veggie Grill, Lazy Dog, 5.11 Tactical, Dolls Kill. Past Boards: Hot Topic (HOTT), Noodles (NDLS), Pinkberry, Kriser’s Natural Pet. Non-Profit Boards: PetSmart Charities. Julie Newcomb Hill, Founder, The Hill Company. Board Member of: Anthem – US health insurer, Lord Abbett Family of Funds – The oldest private mutual fund complex, founded in 1929 and was the first woman on the board in 2004. UNYQ – Silicon Valley start-up, wearable medical devices. Non-Profit Boards: Chair of the UCI Trustees. Past Boards: Holcim (US), a Swiss-based international concrete cement manufacturer, Lend Lease – Sydney based heavy construction company, active in 90 countries around the world, Resources Connection – IPO out of Deloitte, financial services company. Moderator: Cristina Rose Board of Directors: The Claremont Colleges, Metropolitan Los Angeles YMCA. Past Boards: HMSHost and The Mills Corporation. 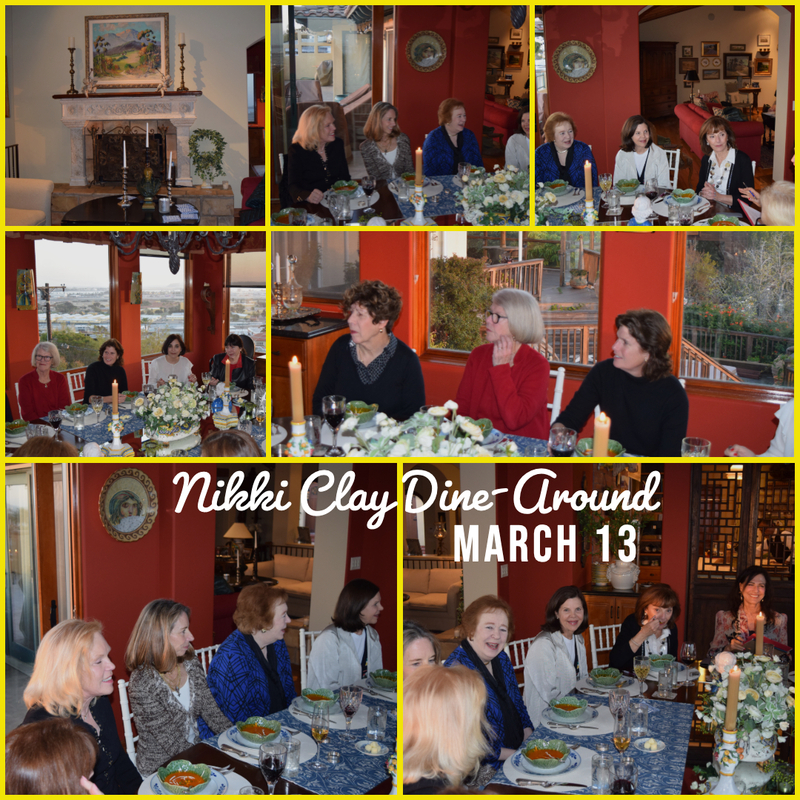 Nikki Clay hosted the San Diego Trusteeship members for what has proven to be their annual gathering to source possible Trusteeship nominees from the San Diego area. 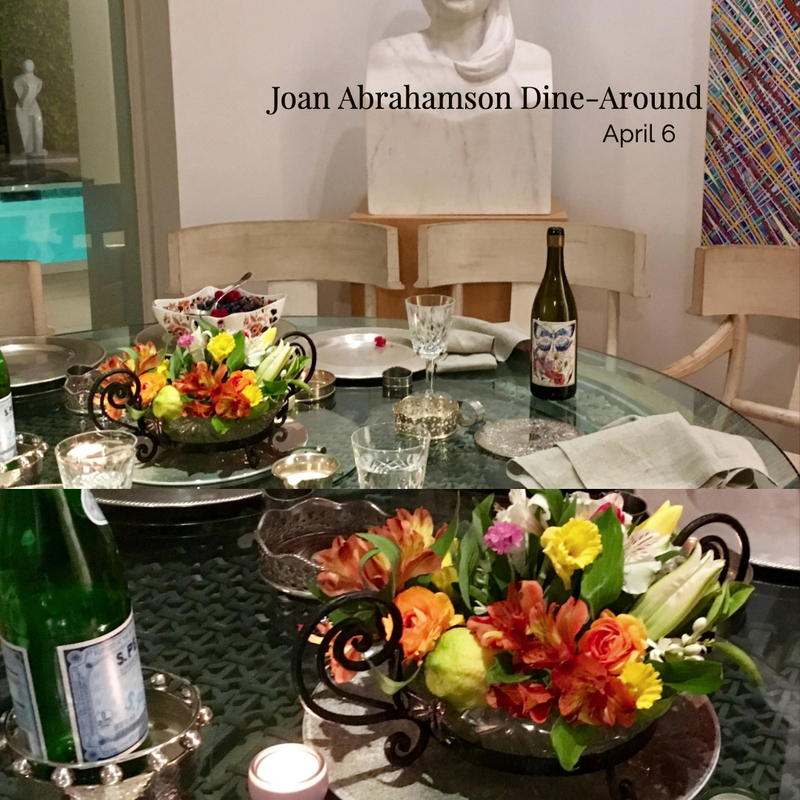 Nikki, thanks for a wonderful party — such a beautiful table and a wonderful opportunity to welcome Mary Ellen and to think about new candidates for the Trusteeship. It sounds like it was a lovely event and the San Diego group jumped to it and nominated three potential candidates! Thanks everyone. Dine-Arounds are favorite evenings for Trusteeship members. 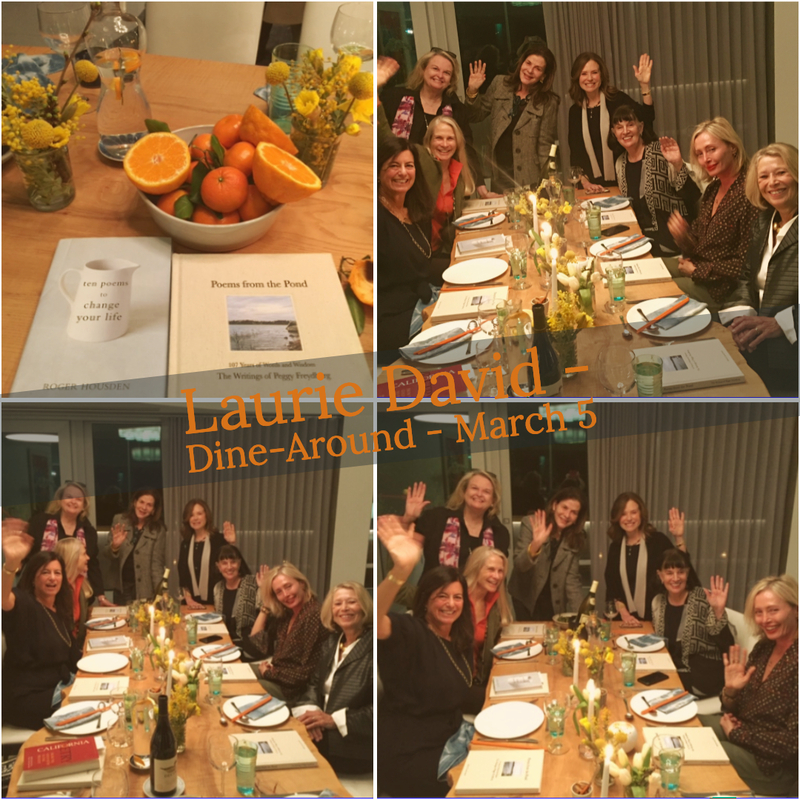 One of our new members, Laurie David, invited seven guests to her home in Pacific Palisades, for a warm and wonderful Trusteeship Dine-Around. Laurie is a producer, author and environmental advocate. She joined The Trusteeship in the summer of 2018 and has picked a topic of conversation: The Power of Poetry – to commemorate the passing of beloved poet Mary Oliver guests were asked to please bring a poem, a paragraph, a line that moved them. And moved them they were. Laurie’s instructions were: Lets Share! What a splendid night for us all (x our early arrivals?!) Kirsten’s lovingly prepared food, choice wines and your holding us to task – having a theme. You command order with grace, knowledge, and compassion. I, along with Miriam, didn’t have a deep appreciation of reading poetry out loud, so your lead of doing so has probably enriched all of our lives just a bit more. Thank you for last night, your book of Peggy’s poetry, and bringing us all together. Good luck with BIGGEST LITTLE FARM and we’ll spread the word. There will likely be a lot of dittos today and I thought I would lead the way. Ditto everything Martha said. It was a beautiful evening. The appetizer and meal selections were inspired; delicious and prepared with such care and attention by Kirsten. Your home is incredible and must give you so much inspiration. I am pleased to have left appreciating poetry much more. The second thing I did this morning (after making the bed) was read – out loud, of course – the first poem in the book, Chorus of Cells. I never knew that making one’s bed could be so meditative until I read Peggy’s poem. Because of you, Laurie, I’m going to start a new practice of reading a poem a morning and evening and, hopefully more in between. Thank you for gifting us the book and a great evening. What a stimulating and FUN evening in your breathtaking home with amazing food and comradery. I LOVED every minute of our conversation which was deep – and sometimes quite emotional. You are an incomparable hostess who makes everyone feel comfortable and very pampered. The food was a gourmet’s delight, unique and delicious.  Thank you for such a memorable evening. Thank you Laurie for hosting such a wonderful evening. Nothing compares to inspiring conversation with beautiful minds… plus sumptuous food and of course poetry. Thank you for the unexpected gift. I will treasure the book of poems. We do try to show our appreciation, particularly when it is so deserved. Good also to try to respond before all the superlatives are used! As a flustered early arrival, I was particularly grateful for your calming and warm welcome and Kirsten’s graceful assistance. It was perfect. The home, the view, the incredible women around the table, who just kept talking (as instructed) fortified by beautiful wine, and exquisite dinner and dessert, all came together in a most memorable night. To the new and current readers of poetry, I would like to share a discovery I made yesterday in my belated search for a poem to read. Poetry Foundation is an on-line off-shoot from Poetry Magazine which has collected some 60,000 poems and thousands of biographies of poets and academic, yet accessible analyses of selected poems by each poet. AND, they do provide spoken word presentations and podcasts on occasion. Thanks to all! Even with all our travels, hope to see you all soon! Dine-Arounds are favorite evenings for Trusteeship members. 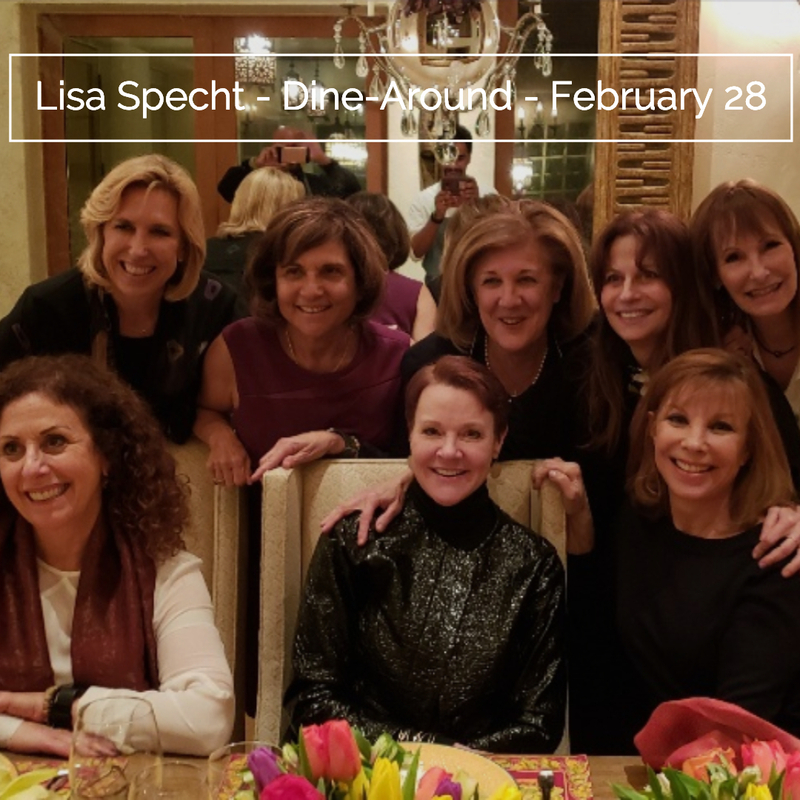 Our board member, Lisa Specht, invited seven members to her home in Beverly Hills for a warm and wonderful Trusteeship Dine-Around. Lisa is a partner at Manatt, Phelps & Phillips, LLP as well as Chair of the Los Angeles Music Center and has been a member of The Trusteeship since 2007. We lucky 8 created a small, powerful, eloquent, passionate universe which I, for one, will never forget! Better than a wonderful time…An important time! Photo From bottom left: Karen Caplan, Rachel Moore, Lisa Specht. Top left: Wendy Greuel, Aya Jakobovitz, Cinny Kennard, Rachael Worby and Gale Anne Hurd.